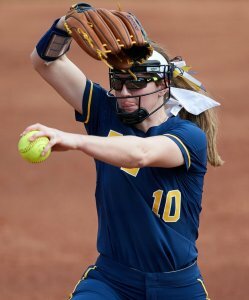 Extra Inning Softball/JWOS College Power Rankings - Week 9 Asks the Question: Is the Pac-12 Going to Produce This Year's WCWS Champion? The University of Arizona's Jessie Harper leads the NCAA with 21 home runs. Photo: Arizona Softball. Perfect showings from UCLA and Oklahoma leave the top two unchanged while series losses by Alabama and Florida State--the first ACC series loss by FSU since 2012--saw some changes among the rest of the Top Ten in this week's Extra Inning Softball/JWOS Power Rankings for Week 9. That makes three Pac-12 teams in the top four spots and shows the conference is strong, at least at the top! The Bruins stayed perfect with a three-game sweep of Arizona State, outscoring the Sun Devils 35-5. The Sooners’ offense came through as expected, piling on thirty-one runs and earning a pair of run-rule victories. The Wildcats also posted a perfect week, going 5-0 with a doubleheader sweep over UTEP and a three-game conference sweep over Utah that puts the Cats at 12-0 in PAC-12 play. 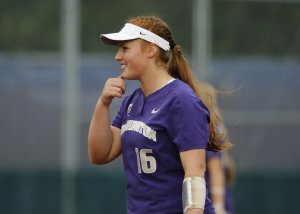 Pitcher Gabbie Plain is one reason the Washington Huskies are a favorite to return to the Women's College World Series. A three-game sweep over California saw the Huskies post a pair of shutouts over the Golden Bears and outscore their conference foe 18-2. The Tigers earn their way into the top five after a series win over Mississippi State, and a nice rebound after a shutout loss in the series opener. The Noles took a midweek victory over Florida, but dropped a conference series to Louisville,including a walk-off loss on Monday night. The Crimson Tide lost their first SEC series of the season, earning back-to-back losses to South Carolina after posting a game one win over the Gamecocks. The Cajuns moved to 15-0 in Sun Belt conference play with a sweep over UT-Arlington. The week’s slate also included a midweek win over McNeese. Despite a midweek, one-run loss to UT-Arlington, the Cowgirls rebounded with a three-game sweep of Kansas, scoring twenty runs and holding the Jayhawks to just four. The Golden Gophers hold fast to their position just inside the Top 10, after a series win over Illinois that included an extra-inning defeat in the middle game of the three-game set. After beginning the calendar week with the final game of a series win over Missouri, the Lady Vols were lackadaisical in their series against Auburn, taking the loss in two of three games. The Tigers took a series win in Knoxville, winning the first two games against the Lady Vols in decisive fashion before dropping the series finale. The Rebels took a run-rule win over Belmont in a midweek game before heading to Kentucky, where they dropped the series opener 11-4, but rebounded with back-to-back victories in the final two games to take the series. The Hokies swept Duke, posting a pair of shutouts to open the series and outscoring the Blue Devils 11-1 in the series. The Gators’ see-saw of a season continues; after a midweek, shutout loss to Florida State, the Gators swept a conference series against Arkansas, holding the Razorbacks to just one run in three games. The Longhorns fell this week more because of the impressiveness of play of other teams than their own transgressions; the Horns took the series win over Texas Tech in a series that saw three low-scoring games. A midweek win over Liberty should age well, while a three-game sweep over Hofstra is always a favorite happening for the folks in Harrisonburg. The Rams dropped their first conference game of the year in the series finale against San Jose State, but won the series against one of their biggest rivals for the Mountain West crown. The Rams are now 29-5 on the year. Megan Beaubien and Michigan swept Big Ten foe Indiana. Mike Janes Photography. The Wolverines put 24 runs on Toledo in a midweek game before hosting Indiana, emerging from the weekend with a three-game sweep of the Hoosiers and moving to 9-0 in conference play. The Badgers moved to 7-2 in Big Ten play, sweeping Iowa in a three-game conference set that included an 8-0 shutout in the series opener. Lu Harris-Champer’s Bulldogs hold steady despite a loss in the series finale against Texas A&M; the Bulldogs won the series against the Aggies, scoring eighteen runs in the trio of games. The Red Raiders dropped the series to Texas, but did emerge victorious in a walk-off win in game two, moving their conference record to 3-6. Despite losing a midweek game as part of a doubleheader against Sacramento State, the Cardinal rebounded to post a win over Oregon State before the latter two-thirds of the series were rained out. The Wildcats return to our rankings after a perfect 4-0 showing last week, including a midweek win over previously-undefeated Loyola Chicago and a series sweep over Nebraska that included two shutouts. Despite losing the series opener to Alabama, the Gamecocks responded in impressive fashion, entertaining a large home crowd with back-to-back victories to close the weekend and earn the series win.